Drinking carrot juice raises blood sugar levels if you have diabetes and if you don’t. Carrots too make your blood sugar go up, whether you’re diabetic or not. And it’s just what it’s supposed to happen because the whole carrot and its juice contain carbohydrates, a type of nutrient that the body turns into sugar to use for quick energy, in addition to simple sugars. And where are all nutrients from food absorbed? That’s right: into the bloodstream. Now, the higher the intake of carbohydrates from plant foods, the higher the rise in blood sugar levels. The lower the intake, the less significant the rise. Some plant foods and some forms of plant foods raise blood sugar levels more than others or faster than others. The more carbohydrates a plant food has, the more likely it is it will increase blood sugar compared to the same amount of another plant food lower in carbohydrates. Different preparations can fast-forward the digestion process, resulting in a quicker rise. This is the case with juices, carrot included. The solids of a food, any food really, take longer to be digested. Some elements longer than others, such as fiber in plant foods. Fiber is basically indigestible plant material that the body cannot process and instead allows to pass unchanged through the digestive tract. Not for lack of trying, though. But the good thing about this is that the attempt at digesting fiber slows down the entire digestion process, including that of carbohydrates. But by juicing a food, whether it’s carrots or cabbage or apples, we are essentially removing the solids and keeping only the liquid. And the liquid doesn’t really require much digesting so it will pass fairly quickly through the digestive tract. Whatever is in it will also be absorbed into the bloodstream more quickly than if it were all contained in solid material. So all the carbohydrates, sugar included, from juice will raise blood sugar levels a lot faster than if they came from whole foods. So whatever amount of carrot juice you drink, expect it will make your blood sugar go up, more than whole carrots and a lot faster. Compared to other vegetables, carrots are also significant sources of simple sugars (glucose, fructose and sucrose) which don’t even need as much time to be digested as other more complex carbohydrates in the juice (which need time to be broken down into their simplest sugar forms). Because they’re already in their simplest form, they don’t require much digesting, hence their effects on blood sugar metabolism. And there’s more: you get about 230 ml of carrot juice from 450 g of juicy carrots. So one glass of juice may provide you with most of the carbohydrates from almost half a kilogram of carrots. 100 g of raw carrot has 9.6 g of total carbohydrates of which 4.8 g sugar, 2 g other digestible carbohydrates that also become sugar and 2.8 g indigestible dietary fiber. 500 g of raw carrot has 48 g of total carbohydrates of which 24 g sugar, 10 g other digestible carbohydrates that also get broken down into sugar and 14 g indigestible dietary fiber. And while not all of the carbohydrate content will be extracted into the juice, it’s still a lot for just a glass. This is not really good for you, particularly if you’re diabetic and need to watch your intake of carbohydrates. Irrespective of how much or little carrot juice you have at once, the rise in blood sugar will occur because the carbs (sugar included) are more rapidly taken up by the body. This is because juices make the absorption of nutrients very accessible. A glass of juice made from 450 g of whole carrots may weigh about 230 ml, so half the weight. And without the solids and especially fiber, it’s not satiating at all, meaning you will get hungry really fast really soon, if not right away. This can make you want to have either more juice or food and add even more carbs to your intake, increasing the chances of exceeding your recommended intakes per day and per meal. Over time, such dietary behaviors have negative effects on diabetic patients and their condition. Summary: Why does carrot juice increase blood sugar levels more than whole carrots? Answer 1: Because it has no solids, no fiber and is liquid, meaning it is taken up by the body very fast and the sugar it provides absorbed just as fast. Answer 2: Because it’s not satiating and you get hungry too soon or right away. This can make a diabetic patient and non-diabetic person want to have more juice or eat, adding to their carbohydrate intake and risking exceeding their nutritional requirements. Answer 3: Because it concentrates more carbs and sugar than whole carrots for the same amount. Answer 4: Because it predisposes to weight gain. It’s better tasting than a lot of things and hard to determine serving size which can lead a diabetic to over consume it. And if the sugar from the juice isn’t used up right away, it’s deposited as fat and excess fat can lead to diabetes complications over time. 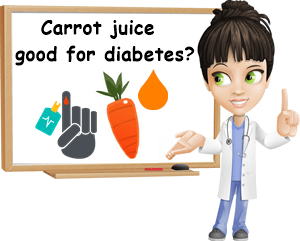 And yet, diabetics can still drink carrot juice safely provided they only have small amounts at once, preferably after a meal low in carbohydrates and containing lean protein and definitely not everyday. Having it everyday is bad for you if you have diabetes because it brings too much of a contribution to your daily intake of carbohydrates. Given the way it’s made, it’s also too easy to have too much of it. Some diabetics may not have any juice at all and may be better off eating whole carrots instead (also in moderation). Carrot juice is good for a diabetic only if it’s consumed occasionally and in small servings (some recommend no more than 100-150 ml per serving), no more than one serving a day. Since sugar is good for muscles (and even the brain), it helps to exercise it right away. Go for a walk, a bike ride or something similar to prevent weight gain and improve blood sugar levels after having carrot or other juices.